The misty low fog drifted off the Red Sea and masked miles of desert to the East and North. This shroud covered the black columns of the infantry battalions and machinery as they moved Westward toward the Mediterranean coast. The troops had bleak faces, for they new if they failed, then they truly would have lost a great deal of ground, and perhaps the war. Ever since the South Asian Union (SAU) and the United Northern State Coalition (UNSC), headed by China and the United States respectively, had banded together to fight the rapidly expanding Russian Federation and New Ottoman Empire (NOE), they had suddenly made a massive increase in progress. With the South Asian Union now firmly allied with the UNSC. Russia had for the first time, realized that this conquest the allies called World War III might not be so easy to win as they thought. Their allies, the New Ottoman Empire, were rapidly becoming divided as the allies played upon the Sunni and Shiite split in the faith that united the Ottomans. Europe also showed signs of recovering from the devastating Nuclear Attack that had started this war. The actual countries of Russia, America, and China, the superpowers now in charge, were spared only because no country dared launch any more for fear of rendering Earth uninhabitable for generations. Despite that, the European Union had been effectively crippled by nuclear bombs and fallout. And so the Russians marched on, if this worked, they would be able to cut off supply lines between the Americans in North Africa and the Chinese attempting to capture the oil in Saudi Arabia. A loud beep on the commander's GPS indicated that his forces had now crossed the border from the No Man's Land in Jordon into the UNSC occupied state of Israel. Half a league, half a league, half a league onward... the city of Jerusalem came into sight, and the old Soviet tansk brought back into action for this war positioned their guns. The commander spoke, "Цель Иерусалим, все батареи раскрывает пожар"
The tanks reigned down a fury of hellfire upon the city of Jerusalem. UNSC forces would be waking up to the sound of a full Russian attack force that had reached the city. The first shots had been fired, the beginning of what could be the deciding battle of the war had begun. Col. Mike "Osprey" Lucan had several things he would be very happy to wake up to. The sound of a mortar exploding near his barracks and a loud siren indicating attack, was not one of them. It was not the first time he had been roused from sleep due to an attack. In less than a minute he had his combat gear on and was running out the barracks door with his modified G36K in hand. He suddenly realized the situation was more dire than he had anticipated. He had been expecting a small New Ottoman force that had somehow made it past the UNSC defense lines, instead he saw what appeared to be a full scale attack that was in progress against the city of Jerusalem. He noticed tanks closing fast against the forward trenches. He noticed a large amount of T90s and T84s that indicated several armored brigades. He also spotted many smaller T-62s, often used as Russian cannon fodder, charging their lines. Scores of them formed a rapidly closing triangle. Col. Lucan new from experience how to gauge numbers. He knew that if his forces stayed, they would be slaughtered, simple as that. The Russians had launched a full scale attack and Jerusalem had neither the manpower nor the firepower nor the competence necessary to resist such an attack. Lucan knew immediately that General Ericson, who commanded the UNSC forces in the area, would order them to hold this vital city at all costs, and those costs meant the lives of him and his men. Col. Mike Lucan always knew the time may come for him to die for America, but he never intended it to be for nothing, he had too many people waiting for him at home, and too many men counting on him to bring them through this, for their sacrifice to be in vain. Lucan commanded the 212th armored division, consisting of 40 Abrams tanks, though only 38 remained. He recently had recieved command of the 222nd armored division and 309th mobile infantry division. Only half his forces were in Jerusalem that night, and they accounted for about a quarter of the defenses, but he still had a major descision that had suddenly come upon him. He pondered all this in about a minute as he raced across the trenches machine gun and light cannon fire flying everywhere, the whirling of rotors and the screaming of rocks and the concussions of explosions permeating the night. He could stay and fight for nothing, or run, save his men, but possibly loose his command. All this he knew before reaching the command center, where panicked colonels and majors in various states of dress were appearing. Their faces seemed to betray exactly how much they comprehended their situation ranging from cocky overconfidence in the younger ones, to anger from those who, like Lucan, anticipated the general's order, to absolute horror from those who realized just how badly they were humped. Lucan swore that if he got out of this alive, he would find a nice quiet beach in California or Mexico where he could sleep without the fear of waking up to possible annihilation. Might this have been somewhat inspired by the battle of Serenity Valley? I never actually thought about it like that before, but looking back, some it may have indeed come from that first episode of Firefly. I ask because you used the word "humped." Alright, yes, that part was definitely inspired by Firefly. "We will hold our ground!" shouted General Ericson, "The Ruskies will never push past our armor. We will fight them to the last man. We'll die if we have to." "Much as I'd love to go down in history as a man who was not afraid to die for his country," said Col. Lucan dryly, ending the general's tirade, "Their armor outnumbers our armor 10 to 1. They've breached the external defenses in several areas, and their artillery bombardment has not ceased since the attack began. Our troops are disorganized and not prepared to fight off such a large force. The wisest action would be to retreat and regroup outside the city. With some breakthroughs in air support that the Air Force is expected to make..."
"Colonel!" interjected Ericson, "We cannot depend on the Air Force to retake this city. We have to fight now and hold them back." "We aren't holding them back," said Lucan, "We're being overrun by enemy tanks. Their cannon-fodder tanks probably outnumber the amount of infantry we have actually fighting right now. We're going to need artillery and air support along with a lot more anti-tank weapons than we have to fight off the Russian's armored force. For all we know, the New Ottomans could be sending troops to back them up." "That's exactly why we've got to hold here," said Ericson. His statement was announcement with a nearby artillery strike that shook the city. "Colonel, you will shut your mouth right now or I'll have you discharged is that clear!" shouted Ericson. "Now I want you all to mobilize your forces and fight to your last breath. DISMISSED!" said Ericson. The officers, still in various states of dress filed out. "Lucan," said Ericson, causing Lucan to pause as he prepared to file out of the bunker they had been meeting in. "If you ever blatantly argue with me again, your going to be scrubbing engine grease of tanks for the remainder of this war, is that clear." "Yes sir," said Lucan, after which he was dismissed by the General. Lucan exited the building. The streets outside were choked with dust and smoke. They were illuminated by fire and tracer rounds. The flashes of the tracer fire and of mortar shells lit up various areas. This came hand in hand with the thunder of artillery strikes and tank cannons. Always constant was the ever present gunfire. The rattling of machine guns or the crack of rifles. Colonel Mike Lucan headed to the second in command of his divisions and also his friend and counsel, Mjr. Jacob "Pilus" Vordann. "Rally our divisions and tell them to execute a tactical withdrawal from the city of Jerusalem," Lucan told Vordann. "You're not going to comply with the general's orders are you?" said Vordann. "He won't like that," said Vordann, a smile appearing on his face despite the grim surroundings, for the two stood by a building, the one next to it was on fire and several more buildings down the street burned. "General Ericson will be dead by midday tomorrow," said Lucan, "If he's lucky." As if to agree with him, a Russian artillery strike tore apart a building a block down the street. "The Russians are pressing deeper and deeper," said Lucan, "Anyone who stays and fights will be dead, or taken prisoner by the Russians, arguably a worst fate since they seem to love skirting around the finer principles of the Geneva convention. We've probably already lost a great deal of troops, we need to pull out before we loose more." "Yes sir," said Vordann, who saluted and ran off to order the retreat. Lucan headed off to where his command tanks was parked, he was going to set up a rally point outside the city so his forces could get out before the Russians completely surrounded Jerusalem. "Can you imagine piling up the bodies of soldiers, friends, to build a wall because you've got no cover... 5 days in, there were so many officers dead, he commanded 2000, kept us together, kept us fighting, kept us sane. By the time the fighting was over, he had maybe 400 still intact... I said the fighting was over, you see they left us there... while they negotiated the peace... and we kept dying. By the time they sent in med ships, he had about 150 left, and of our original platoon, just me. Mercy, forgiveness, trust, those are things he left back there..."
I will fear no evil: For thou art with me;"
"INCOMING!" James Isoldeer shouted as he dove behind the M-1 abrams he crewed along with Sergeant Ryan Veni. 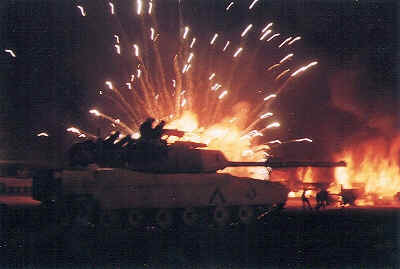 Ryan was, currently, inside the Abrams, and barely noticed as the light tank fire, bounced off the outer armor. "For crying out loud, would you return fire!" shouted Isoldeer as he hopped into the drivers seat. and I will dwell in the House of the Lord forever," Sergeant Veni finished following which he turned slowly to Isoldeer and said, "That'll give away our position, sides, the Colonel wants us to save ammo. "FOR WHAT!" shouted Isoldeer as another round hit near the tank. Veni handed him a paper, bearing orders from Mjr. Vordann and bearing the authorization of Col. Lucan. "He wants us to pull out," said Isoldeer understanding. "The Colonel knows we can't hold the city with what we've got, he's setting up a rally point outside of Jerusalem. My guess is, he wants us to either head north and block the roads to Beirut , or head South and block the roads to Cairo. Either way, if we stay, we'll be slaughtered." "Well then," said Isoldeer releasing the breaks, "Let's move out." The Abrams rumbled forward as it headed through the city toward the Western gates. "Sir," an adviser shouted as he ran into Ericson's office, "We have reports of several armored divisions and some infantry leaving through the Western gates, some of them are under the command of Col. Lucan." "Damn him, damn him to hell!" shouted Ericson, smashing some Jewish figurines on his desk and scattering papers. "Send a messenger to tell him if he doesn't turn around right now..." but the general was unable to finish his sentance, a Russian artillery shell struck the command center and sent Ericson flying across the room. The aid was less fortunate, and was impaled with several pieces of shrapnel and could only gasp his last breaths on Ericson's office floor before dying. Ericson slowly rose, seeing the carnage and destruction in is office and his dead aid. He walked outside the command center. The sensory wall hit him like the artillery shot did. He saw his men, dying by the dozens in the streets. The city was burning, burning to the ground. The Russians seemed content to follow the parking meter rule, i.e. nothing larger than a parking meter should be left standing. He saw some of the enemy MLRS vehicles fire from a distance. Hundreds of rockets careened into the city and lit it up, tearing apart the structures. Ericson could only stare as the black hulks of the enemy tanks rumbled down the road, churning up dust as they caught his troops in a crossfire of machine guns. "Have mercy on us," said Ericson. The level of the command center beneath him erupted into flames. The soldiers were close, their was machine gun fire on the stairs, he could hear the last of his guards putting up a fight. "And bring us to everlasting life." A single grenade rolled onto the balcony he stood on. He closed his eyes, and breathed his last. When I first began reading this, I thought this was a book about Operation Desert Storm. But, when China was mentioned, I knew this was a fiction. And when I read "Close Allies," I knew that the possibility of this being even remotely non-fiction was exactly one to infinity against. Good book so far. You may want to consider combining everything into the first post, although it's your decision. The posts have no character limits. Creative Corner :: Writings :: Stories.